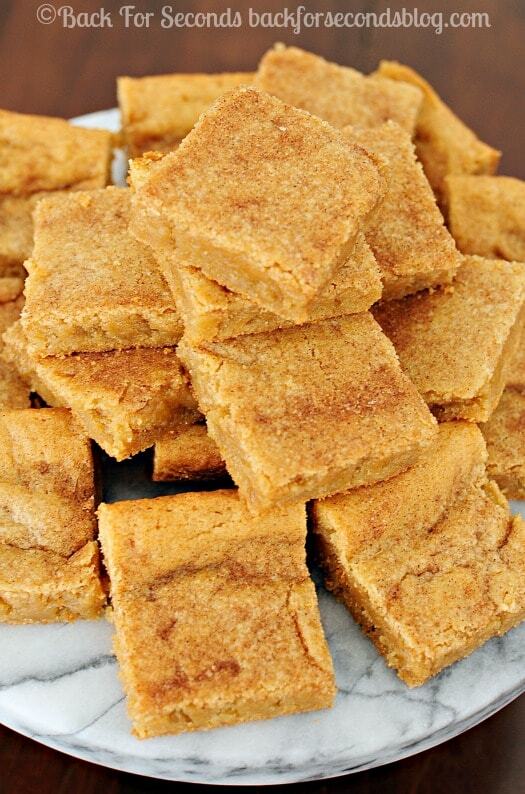 Cinnamon and sugar collide in these Soft and Chewy Snickerdoodle Bars. One bite and you’ll be hooked! Perfectly chewy with a crisp sugar crackle on top. I never met a person who didn’t like snickerdoodles. There’s something so comforting about the warm, buttery, sweet, cinnamon cookies. Now it’s easier than ever to have that fresh baked goodness. 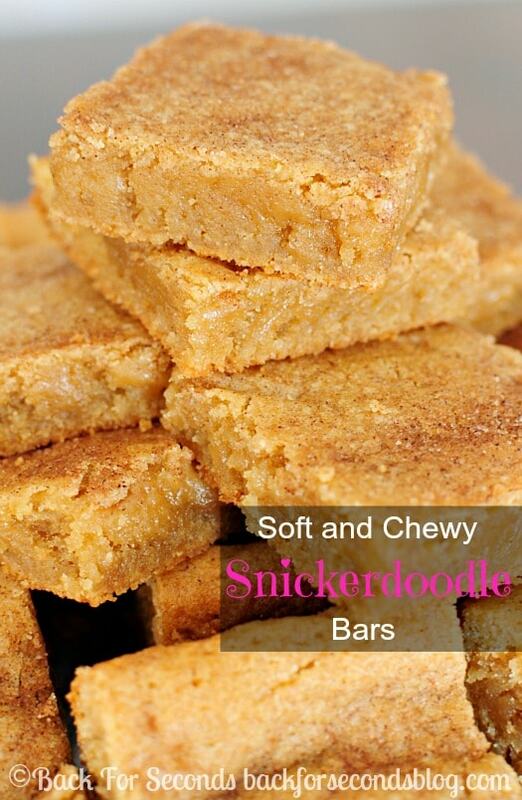 Enter: Soft and Chewy Snickerdoodle Bars! These bars are magical. 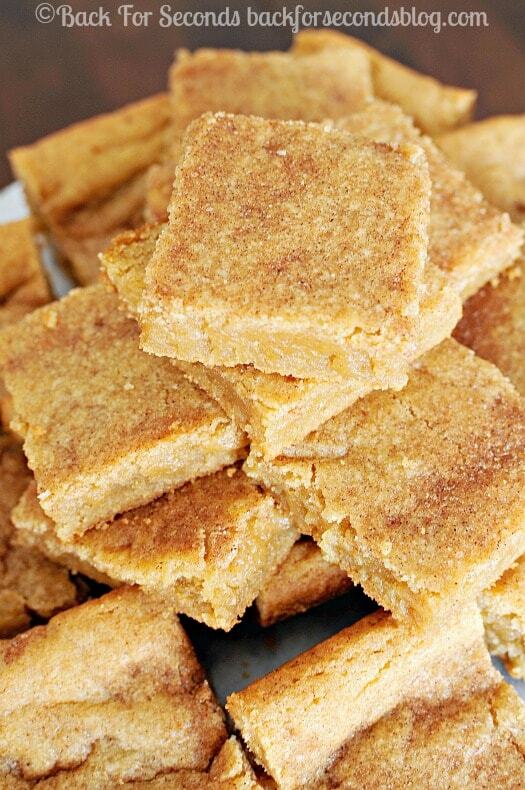 They are soft and chewy with a slight crunch on the outside from the cinnamon sugar topping. They are buttery yet light. They are completely and totally addicting! It’s almost worth making these simply for the aroma that will fill the air as they bake. Ahhhhh. It’s hard to beat one of these snickerdoodle bars fresh from the oven! Go ahead and make a batch – I know you will love them! I brought these to a family reunion vacation a few weeks ago, and they were a HUGE hit! Everyone loved them, and the whole batch was gobbled up in a flash. I am making them again tonight for another family vacation (with the other side of the family this time!). The only change I made was to add to the topping amounts—I used 1/4 cup sugar and 3 tsp cinnamon, just because I really wanted a nice sweet crunchy top. Thanks for the recipe! It’s going to be a regular in my house, too. Took these out of the oven about an hour ago and ….so far I’ve already had three lol. They are soo good! What I did was press it into a cookie sheet – 10 x 13 maybe? – and got a nice bar that isn’t too thick but not thin and crunchy either. These will be made again…though next time I’ll sprinkle more cinnamon sugar on top. Forgot this time that a larger area might need more to sprinkle on lol. I was searching on Pinterest this morning for a new bar cookie recipe when I came across your Snickerdoodle bars. I am so glad I did! I made them twice today and everyone loved them! My family likes a soft cookie and this recipe gave them that. Thank you so much for sharing. Made these and they were delish!! Thinking about using it for a cookie exchange- have you tried freezing them? If so, how long did they last? So glad you liked them! You can absolutely freeze them! They will last up to 3 months in the freezer. I am considering making these for holiday baskets we deliver to clients. I make all the baskets in a couple of days, then we deliver them over the next week. I worry with some recipes about the cookies getting dry before the clients enjoy them, so I am wondering about scooping this batter into mini-muffin liners for baking, more like a cookie ball. Wondering your opinion on how this would work for this recipe. I want to make these so bad but only have salted butter. What can I do? Can I just omitt the salt in the recipe?